Children growing up in high poverty neighborhoods face many challenges—evidence is growing that even the stress of living in deep poverty may threaten their life chances from earliest childhood. With the proportion of children living in extremely poor neighborhoods rising, the need to find strategies that can help reduce the impact of this toxic stress is critical. The DC Promise Neighborhood Initiative (DCPNI) is one of a network of community-based initiatives, supported by the U.S. Department of Education, that are working to create a continuum of services to support children from cradle through career. The hope is that this supportive community will improve children’s health, strengthen families, promote education, help children do better in school—and ultimately, become successful adults. DCNPI grew out of a partnership led by Irasema Salcido, CEO and founder of Cesar Chavez Public Charter Schools. 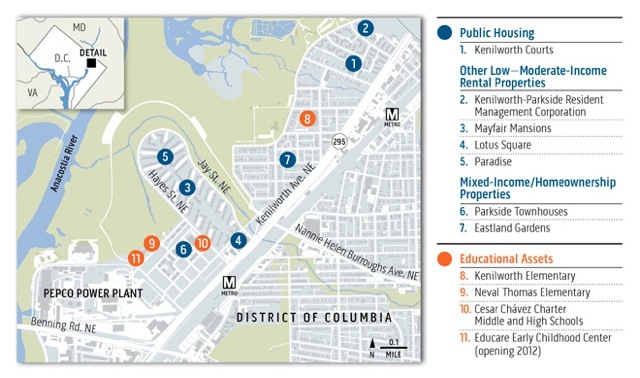 The Chavez Middle and High Schools-Parkside sit in the Parkside-Kenilworth community, one of DC’s poorest and most isolated neighborhoods. Nearly half of the neighborhood’s residents live below the poverty level, most households are headed by single mothers, and the neighborhood’s teen pregnancy rate is among the highest in the country. The community is extremely isolated, cut off from the rest of the city by a highway, a decommissioned power plant, and federal parklands. Mrs. Salcido noticed that children were entering her school with skills well below grade level. The inspiration for launching DCPNI was to figure out how to help improve the life chances for children growing up in Parkside-Kenilworth. Bringing about a better future for the children who live in Parkside-Kenilworth’s communities will require a sustained commitment and a willingness to learn from mistakes and adapt to changing circumstances. DCPNI has spent the past year planning to launch this ambitious initiative and has partnered with the Urban Institute to ensure that its efforts are data-driven and regularly evaluated. DCPNI has already made great strides during its planning process in engaging residents, developing comprehensive plans, bringing together organizations and resources, and laying the groundwork for a sustainable initiative. Its long-term success will depend on the ability of its leadership to build on these achievements and successfully implement its core solutions. You can hear about these efforts at a forum at the Urban Institute on January 24. Watch a video webcast or a recording of the event at http://www.ustream.tv/channel/urban-institute-events (no registration necessary). Read an op-ed in The Root DC from DCPNI President Irasema Salcido.